We have returned from The Great State of Texas. You don’t mess with Texas. Apparently you also don’t mess with the digestive tract of small children without a nod to the porcelain God. Our family mostly escaped unscathed from the travels without digestive difficulties requiring bran muffins and prunes for resolution, but our dear sweet Dos did spend one night throwing up in the toilet. Not because she got a hold of a bad bunch of Habanero. Nope, she emptied the candy bag in the space of about 40 minutes. See, we have the coolest family on Earth (humble, I know, but many of them are from The Great State of Texas so what do you expect?!) and when we arrived at our reunion each child had a gift bag filled with crackers, cookies, water, juice, and various forms of candy involving Red Dye and Kiddie Crack. Dos wolfed that sucker down while we were mid-hug and caught up in the how-do-you-dos. That night she started throwing up. The next morning I asked her what happened and she admitted she ate more candy in moments than she’s consumed in almost the rest of her lifetime. Even puking didn’t slow her down. She’s ready for more candy right now! 1. Be realistic. Your children will behave both more angelically and more devilishly than normal in turns. You, yourself, will behave both more angelically and more devilishly than normal. Give everyone around you (and yourself) grace when things get hairy. Everyone’s a little bit out of their element. 2. Oops! make the best memories! The best memories are the ones where things don’t go quite according to plan. Our family reunion included a three hour restaurant wait for food. We were able to watch one of our party go to the bathroom wearing a glow necklace tail because the wait made a few people creative. I’ll always treasure the memory of my cousin as a firefly! 3. Be pleasant. We traveled with six adults and six children ages seven and under in a 15-passenger van. When we exited the van the first day our family members who saw us pour out of that big white beauty started praying for us, certain we’d be ready to kill each other. We weren’t! Yes, tempers were strained and temperatures soared, but we worked to be pleasant and encouraging despite our irritation (my sister and brother in law are particularly good at this). It made everyone happy. Attitude is a huge part of family reunion success. 4. Share positive about other family members. We had a new branch of the family tree join us this year and spent a lot of time filling them in on names and back stories. It’s awesome to make a conscious decision to share the positive elements of other family members and let any parts that rub us the wrong way be discovered naturally. 5. Wear nametags or don’t be offended if you have to ask for names more than once. I can’t figure out the names of the children I bore in my own body most days. I’m not going to be spot on with names of relatives I see every other year. This is normal, natural. If you want to get really ornery, introduce yourself to a few people with a new name that’s almost exactly like yours – i.e., Kathy/Cindy, Bill/Will – and see how many generations it takes for the confusion to sort itself out. 6. Plan activities. The best family reunions have activities that bring people together toward a common experience along with time to visit. The activities help in future reunions, because it’s a conversational gambit to break the ice. 7. Be yourself and relax. You’re all in this thing called “Family” together. In fact, you probably all have Aunt Erma’s hawk nose or Grandpa Bob’s oddly shaped big toe and no one needs those awesome matching t-shirts to know you’re family. There is no normal, all families are goofy and have a few skeletons in the closet. You’ve got genetic code in common with your extended family members, so be yourself, be forgiving, relax and let a friendship draw you together as well. 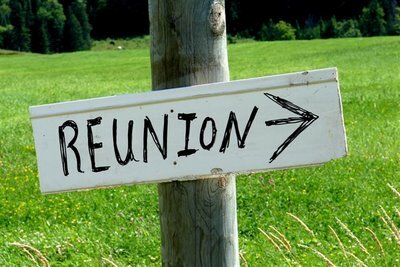 What are your tips for an awesome family reunion?